I picked “Sea Monsters” from scoop.it SL Destinations for my simploring tour on Tuesday afternoon, September 11th. Sea Monsters is, according to the landmark description a photo and installation art exhibition of Citta Wiskee. It was opened September 1st and is going to stay at least until September 30th. The landing at “Sea Monsters” is at a wooden pier. You see another small island not far away from the pier, the secenery is mystic (I kept the proposed windlight settings for my visit), a white glowing small being is next to you, a whale jumps out of the water nearby and hides again in the sea, you hear some kids talking or singing but can’t understand it, there’re white particles hoovering in the air and soon you’re caught in this fantasy world. 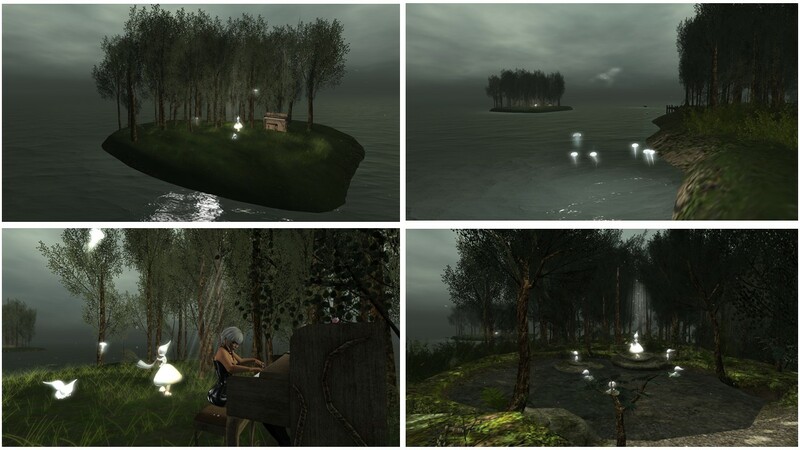 I walked into the forest that begins just at the pier and found more ot the white glowing beings gathered in a forest glade in the center of the island. Walking to the other end of this island some other glowing particles hoover over the water, looking like mushrooms or flying jellyfish. I continued my simploring tour getting an overview and zoomed out into an arieal view. 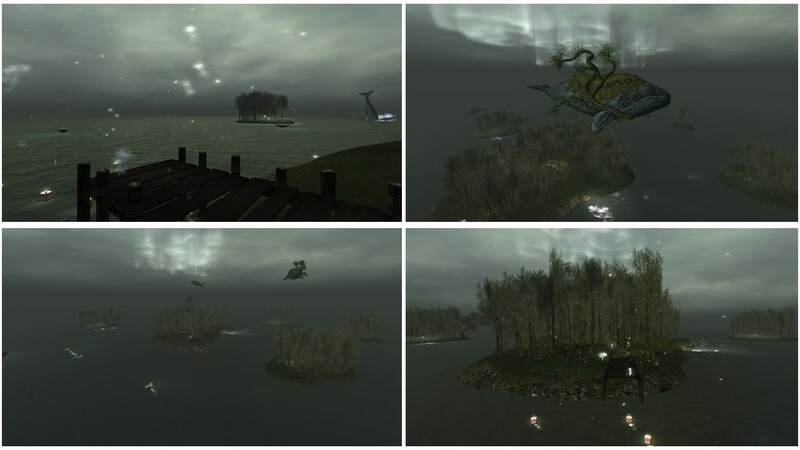 “Sea Monsters” consists of several small islands, the one you land on is the largest of them. A big whale with a tree growing around it’s body flies over the islands like an airship. You can take a ride on this whale. Some other whales circle above the islands flying. I visited the other small islands and each of them holds a little fantasy art installation. There’s one with a piano where you can sit down and play, another with several cushions to sit down and to watch a slideshow that tells the story of two girls exchanging their dreams and wishes, one with a little bird in a cage. And on every island you find groups ot white glowing fantasy beings. It is a really mystic but very peaceful world. Under water is an exhibtion of Citta Wiskee’s photos. I assume that at least some of them, if not all, were taken at “Sea Monsters“. 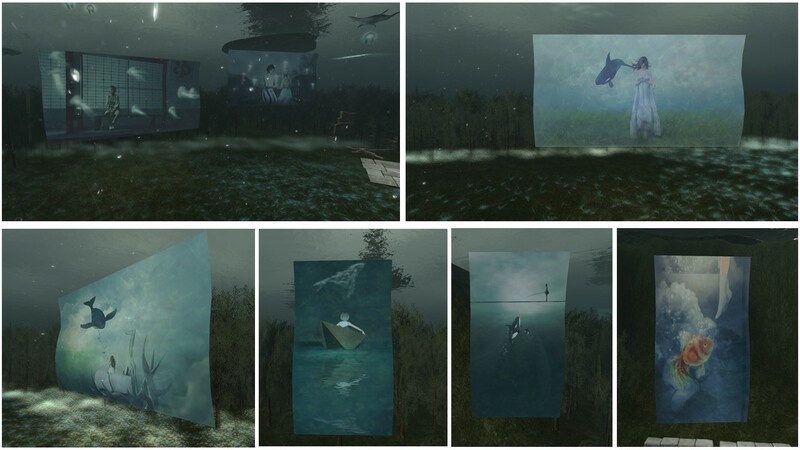 They show scenes of people interacting with eachother or with whales. The pictures are not flat and there’s a film of algae wavering on the surface of the pictures that provides a very particular impression in addition with the fishes swimming around. I liked it. Last but not least I tried to find out more about Citta Wiskee and looked up her profile. She owns a store named ATTIC that sells mesh objects, a few extraordinairy clothes and weired stuff. A lot of stuff is sold as gatchas though, a way of selling that I don’t like. But I like the little items she creates and sells. And some of it you’ll also find at “Sea Monsters“. Next to Citta’s store is CLAVv, a store for Men’s Mesh Clothing and Accessories, owned by Pierre (thepierrot)…. and Pierre is the founder of the group, that owns the sim, where Sea Monster’s is installed right now. Thank you Citta and Pierre for this fantasy world, this piece of art to discover, explore and hang around dreaming. Remark: As “Sea Monsters” might close by the end of the month, I publish this blog post ahead of schedule.